Tom Meyers was born in Antwerp, Belgium (1970). After training as a chef, he travelled the world and worked as a waiter and sommelier in hotels and on Cunard’s flagship the ‘Queen Elizabeth 2’. At 29 he started his own business, a gourmet deli – which failed and led him into an existential crisis, wanting to give up on life. Three questions saved his life, gave him a sense of purpose and helped him become the person he was born to be. Today, Tom is an osteopath with a private practice in Brussels, a forward thinker, keynote speaker, author and the founder of ‘Reaset’, a novel body-mind and educational approach to manifesting your best future ‘stress-resilient’ self today. As new emerging technologies like artificial intelligence, robotics and machine learning reshape our world with unprecedented speed, scope and complexity, learning how to live and act 'on purpose' will become the greatest gift you have ever given yourself. This gift will empower you and enhance your health, well-being, self-actualization, welfare, relationships, self-esteem and stress-resilience. But how do you find your purpose? How can you design your life 'on purpose' and become the person you were born to be? As Tom recounts his moving personal story, you will learn how, through a three-step process, you can find a deeper and holistic understanding of your talents, your potential, and who you are. With this knowledge, you can design a life you wake up to every morning with a smile on your face, feeling happy, fulfilled, resilient and ready for the future - regardless of what other people say or how much the world changes. FREE Download Chapter 1 of "Futurize Yourself - Design your Life on Purpose"
Many people are struggling to cope in today’s hi-tech world – so what will it be like tomorrow, when everything is moving even faster? That is one of the problems Tom Meyers addresses in his book Futurize Yourself - Design your life on purpose. He also candidly draws on his own personal experience to explain the benefits of the approach he has developed. Tom Meyers is an osteopath, body‐centred stress expert, founder of the ‘Reaset Approach’’ who has been working with patients with stress-related ailments for more then 15 years. Tom is a forward thinker and has been sharing his ideas and experience internationaly as a speaker, the hosts of the International Stress Management Associations (ISMA) online stress summit, through his radio feature “Health Matters” and as guest author in various magazines including Thrive Global, Together Magazine, Executive Secretary Magazine. As a global speaker, workshop facilitator, researcher and therapist Tom’s mission is to inspire and empower people to live well and thrive in body, mind and spirit in a fast‐changing, uncertain and challenging world. He is committed to create a positive impact by inspiring people around the world to get future-ready and help them to become better at being human in a fast-changing technological world. Tom is working on a follow-up "Futurize Yourself: Evolving on purpose" in which he will highlight the challenges of the Fourth Industrial Revolution This new revolution is unlike anything we’ve ever experienced before and will lead to new health and well-being challenges that humanity will need to learn to cope with and navigate. How do we survive technological disruption and stay relevant when machines become more intelligent and competent than we are? What purpose do we serve when everything changes around us and exponential change is the new normal? To solve these questions Tom empowers the reader to Futurize themselves or in other words to become future-ready, by designing a life (HOW) based on their purpose (WHY) and by awakening and developing their potential, their unique set of skills from within (WHAT). What purpose to you serve when everything changes around you? They key message of the book is how to find your purpose and design a life you want to wake up to every morning. A life that is future-proof, resilient and in which you can navigate with ease the challenges ahead and the changes emerging technologies will have on every aspect of your life without becoming technology. This message is related through the story how three questions saved Tom's life 18 years ago when he was 29. Three questions and 15 minutes of my time was all it took to discover his purpose. When looking back, these questions that he was given were part of a three step process he had unknowingly undergone to find out and ultimately become who he was born to be: A global communicator, teacher, researcher and therapist. The first step he had to take was to change how he thought about his experiences, about himself and shed some limiting beliefs that he had picked-up on the way. Only then was he free enough to embark in step two, to see his potential within through the mirror-perspective the three questions gave him. With a new outlook on the past and insights on his potential he was able enter step three to - although with trepidation - design his life on purpose. A life he wanted to wake up to every morning. A life he knew through step one and two that was close to his heart. Unknowingly, the process and dedicating his life to his purpose and mission he Futurized himself. "A quick road to influence! Tom Meyers focuses in on one of your biggest barriers – overcoming your own self-sabotage at stepping into leadership, in stepping into the life you dream to make a difference in the world. Taking action on your dreams is paramount. You are the one the world is waiting for. Futurize Yourself is an inspiring testimony that success, influence and all wonderful things lie in the realm of learning to notice how you think about yourself and act upon your dreams." "Why do I exist? What makes my life worth living? If passion is the ultimate expression of your talent, what is mine? What is my purpose? 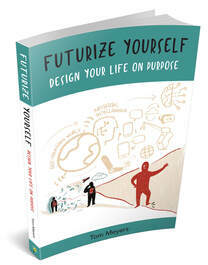 Futurize Yourself shares Tom’s personal life story on his quest for purpose. By doing so, helping you to sparkle and transform. Get a grip on your ‘why’ by being the master of your fate and the captain of your soul." “I finished reading your book... And yes, I couldn’t put it down once I started reading it... You are a wonderful storyteller, connecting different dots of life to transform “Impossible” to “I’m possible”... Such an inspiring story! I really hope that you will consider designing and delivering workshops based on this book. Or retreats – whatever sounds better to you. I’m saying this because I could see you already doing it while I was reading the last part of the book." "To lead one’s business or one’s life requires a sound inner state from which to operate. Both Tom and his innovative ‘Reaset Approach’ represent this so powerfully. Futurize Yourself is the product of Tom’s strength, vision, and persistence and is full of practical tools and tips to start taking control of your life, amidst all the noise of life. I witnessed this project beginning in 2014 and am so impressed and proud where Tom’s taken it. I’m grateful to have known him, and I know that through this book he is going to influence the world for the common good. Grazie Tom. " "Purpose, Dreams, Vision – Ageless words of wisdom – Tom has eloquently shared his personal story and easy-to-achieve practices that have led him to his purpose through believing in his dreams and creating his vision. He offers you 3 questions to move on your journey to an undisclosed destination and once you feel you are approaching that destination, you realize this is not the end as the destination remains fluid. A fabulous read which makes you consider your life and say to yourself, “Well, what the hell am I doing? !” Congrats on penning this book of opening!"